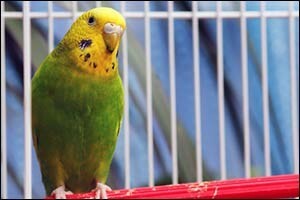 When it comes to taking care of birds – small, medium or large – there are a lot of misconceptions, even among the so-called experts at the big box pet stores. It is important to take the time to research the dietary and habitat needs of any pet before adopting them and bringing them into your home. Consult with your South Coast veterinarian at Anchor Animal Hospital in Dartmouth to learn about tips for bird care in winter, nutritional tips, habitat requirements and the importance of regular veterinary check-ups. Other winter tips for small pets outside of birds and the more common cats and dogs, can be found on our website or discussed with our team of professional veterinary experts. One of the worst things that you can do for your pet bird is to feed them a seed-only diet. Like humans and other creatures, birds do best when they have a balanced diet that includes fruits, nuts, seeds and vegetables. Seeds are not an appropriate choice as a daily diet, no matter how much your bird enjoys them or how many companies provide seed-only diets and promote them as being “complete nutrition” on their packaging. Seek out experienced veterinary care in Massachusetts and ask about the type of diet that will provide your bird the optimum nutrition based upon the type, size and age of the bird. Seed-only diets can lead to a number of nutritional deficiencies, including malnutrition. Even birds that appear to be obese could be “starving” nutritionally if they are only eating seeds. Your South Coast veterinarian can recommend a dietary change for your bird, which will typically include a base of pellets mixed in with fresh veggies on a daily basis, along with a small amount of nuts, seeds and fruits for variety. Always seek the advice of a veterinarian when making a major change in your pet’s diet to ensure there aren’t any unintended consequences. Feed Your Bird Creatively – Another important tip for feeding pet birds is to understand that birds enjoy “working” for their food. They are natural foragers and love to dig for morsels of food in the wild that are hidden inside of branches and sticks, leaves, shells and other natural elements. To help keep your bird interested in its food, hide pellets inside of hollow toys or mix them in with inedible items to inspire the hunting instinct, place veggies and fruits on a shish-kabob and use feeder tools for millet and other treat items to create as natural of an experience as possible. Your bird will be happier and healthier for your efforts. Depending on the type of bird that you have, it may have the “run” of your home when you are present. Birds can get into a lot of trouble if they are not monitored consistently, so it is a good idea to remove any dangerous items just in case you get distracted for some reason. There are a lot of foods that seem “safe” for pets that should never be given and a lot of food items and consumable items that people often overlook as being potentially dangerous. Even foods that may claim to be made for birds should be checked out carefully to make sure they do not contain dangerous ingredients. While vitamins and other nutrients are important for your bird’s survival, there are some that can build up within fat tissues in birds, such as Vitamins A, D3 and E, causing toxic reactions. Other vitamins are known to be common deficiencies in birds. Taking time to speak with your South Coast veterinarian about which vitamins and supplements should be offered to your bird based upon its own unique nutritional needs. Vitamins and supplements should only be used upon advice and recommendation by a licensed veterinarian and not based on any informational article or advice from a pet store representative. Speak with your vet about bird care in winter and other winter tips for small pets, to ensure that your bird gets the right nutritional balance all year long. While some areas of the country may be more appropriate for tropical birds, that doesn’t mean that dedicated bird owners in the northeastern states cannot successfully care for their birds by building safe habitats that mimic their natural environments. Temperature is also important, especially during the winter months when temperatures can drop well below safe levels for birds. Make sure to speak with your South Coast veterinarian for tips on keeping your bird’s enclosure safely warmed during the winter to prevent illness. Keep the habitat, as well as all bowls for food and water, cleaned on a daily basis. They can quickly become over-run by bacteria and mold if neglected. Any leftover food that is not eaten should be thrown away promptly to inhibit the growth of micro-organisms within the enclosure or on toys and other things that your bird comes in contact with on a daily basis. Bird waste, food dropped into water bowls, regurgitated food and even dropped features should all be cleaned out of the habitat each day. Our team of highly trained and experienced veterinarians provide a wide variety of services for pet owners in the South Coast area. If you are in need of veterinary care in Massachusetts or Rhode Island for cats, dogs, small pets, birds and other exotics, give us a call at 508-996-3731 to set an appointment or to learn more about our services. Whether you need a regular check-up, vaccinations, treatments such as dental care or emergency services, you can count on Anchor Animal Hospital in Dartmouth.